Within a few days of submitting our foster dog application, the rescue rep emails me: The dog at the shelter in Olympia is no longer on stray hold, and he’s going to pieces at the shelter. He arrived as a happy, bouncy boy and now cowers at the back of his kennel. Are you interested in fostering him? Sure, I reply, and a few days later, The Child and I sit in the car discussing dog names in unexpectedly heavy Sunday morning freeway traffic. We come up with a list of names, none of which seem quite right, but of course we haven’t met this dog yet, and only have a couple of blurred camera phone photos to go by. He doesn’t look like much, to judge by these photos, but then we meet him: Brown eyes that ask to be loved, a dazzling white and copper coat. He rushes to me, then sits on my feet, looking up at me and leaning against my legs. I had feared a mad rush of memories, but this Red Dog is nothing like The Dog. Over the next few days, The Child and I get to know the Red Dog, who is young, and feisty, and though he is well-trained in many ways, still has some things to learn, like how to get into a car. He keeps an eye on me during the day, following me from room to room, upstairs and downstairs. He cannot bear to have me leave his sight; I cannot tiptoe quietly enough to slip away unnoticed. I take a new route when I walk the Red Dog, and sometimes I accidentally call him by The Dog’s name, but for the most past, being together is a good arrangement; the unbearable emptiness I have felt since The Dog’s passing finally starts to recede. Mr. Faraway comes to visit the following weekend, and it is a weekend full of errands, but he doesn’t complain about the trips to the mattress store, to downtown for The Child’s school project research, or to the various stores to get the fixings for dinner. I decide to go to the specialty butcher, the guy with the really good meat, partly because I get so little meat that I feel like I can indulge in the very best quality, but also because the real butcher has real bones and other treats for dogs. The Red Dog is delighted with the pig skins we bring him. 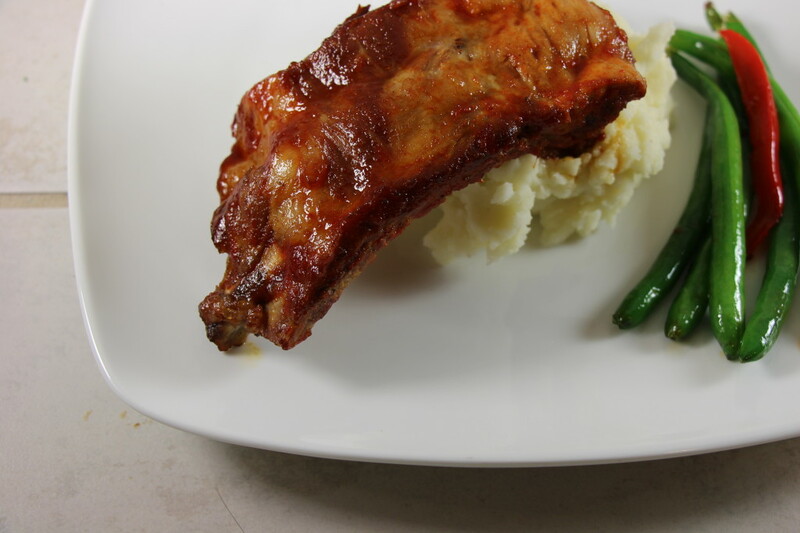 For us, I buy spareribs, because I have lately been poking through cookbooks that I’ve had on my shelf for a long time but never actually used. Some of them land on a pile of potential donations, but one book in particular has me scratching my head wondering why I’ve never used it: Patricia Wells’ The Paris Cookbook . Most of the recipes aren’t especially hard, and several are quite appealing. I opt to try the recipe for spareribs first, because it involves a minimum of prep work, and spareribs are one of those things that I just haven’t had good luck finding a recipe for. The last recipe I attempted was something I found in a google search and involved a sauce made out of blueberries, which seemed appealing enough in theory, but in practice made me wish I’d saved myself the trouble and simply gone to Outback. These were not those ribs, though. Wells’ sauce is incredibly simple: Mix three ingredients in a bowl. Wells suggests you make your own Thai curry paste and provides a recipe for that; I used a jar of red curry paste from the supermarket. The sauce has just the right level of heat and flavor, and would be fantastic on grilled chicken or grilled anything, really. I enjoyed the ribs, though I was hoping for a bit more spiciness; I doused mine liberally with the extra sauce for added flavor. I think marinating the meat in a bit of the sauce ahead of time might do the trick. Mr. Faraway thought the ribs were delicious the way they were, and didn’t need a thing. We agreed the sauce was superb. Prepare the sauce: combine honey, tomato paste, and curry paste in a small bowl. In a large roasting pan over moderate heat, heat the oil until hot but not smoking, Add the pork ribs and brown well on each side, about 2 minutes per side. With a pastry brush, brush about half of the sauce on the ribs. Reserve the remaining sauce to serve at the table. Sear meat for a minute more per side. Pour with wine and lemon juice over the ribs. Cover the pan tightly with aluminum foil, and place in the center of the oven. Cook about 1 ½ hours, until the meat is very tender and you can wiggle the bone from the meat with very little effort. 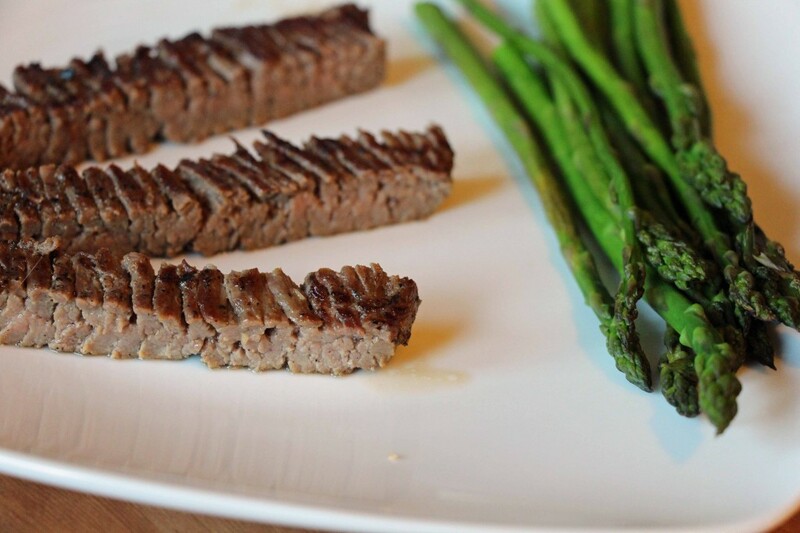 Cut the ribs into serving portions and serve with the remaining sauce. My father had a dog once, and when it died, the loss was too great: He never had another dog. I tell him, that’s how I feel, but I am so lost without him. I’ll foster a dog. I can help out another dog while I get used to this new reality. That’s a good idea, he says. I tell The Child about this plan, and she says, I don’t think The Dog would mind. He’d want someone to look out for us. I email the breed rescue group and submit a foster family application and the state rep gets right back to me: We have a couple of dogs in dire situations, I will put you to work soon. Mr. Faraway comes to visit the next weekend. I tell him about the possible rescue dogs: We may have to drive to Olympia when you’re here, or there’s a dog that sounds like it’s in Spokane? He’s driving four hours to see me, but does not complain about the prospect of an additional road trip. He asks about the dogs and whether I’ve heard any updates. I check my email a lot during his visit, and he doesn’t complain about that, either. We run errands with The Child – nothing that we can’t stop doing easily, if we are suddenly needed. After a while I realize this is a slower process than I thought it would be, and probably nothing is going to happen this weekend. I should make dinner, and I have a guest, and I cannot focus on anything, and I have nothing planned. Don’t worry about it, he says. We’ll figure it out. We go through a pile of cookbooks I have checked out of the library, but everything seems a little too complex to me. I want something familiar, and simple, and finally decide that the only solution is something I’ve made dozens of times: Alice Waters’ roast chicken. I found this recipe years ago in a cooking magazine – I think Food and Wine, but don’t hold me to that. I was struck by its simplicity, and if memory serves, there was originally some sort of introduction by Waters advising the reader to Use Fresh Herbs. Truthfully, I’ve used dried herbs many times, and though the chicken comes out just fine, fresh is definitely better here (and as a general rule). The chicken smells divine toward the end of its roast – don’t be tempted to take it out too soon. Be warned, the temptation will be great. I served this with a simple side dish of roasted new potatoes and brussels sprouts, which we tossed in olive oil, salt and pepper, then added to the oven for the final 35 minutes (adding some garlic cloves to the pan after the first 10 minutes). Everything was done at the same time, and worked together perfectly. The only difficult thing about this recipe, in fact, is the waiting. 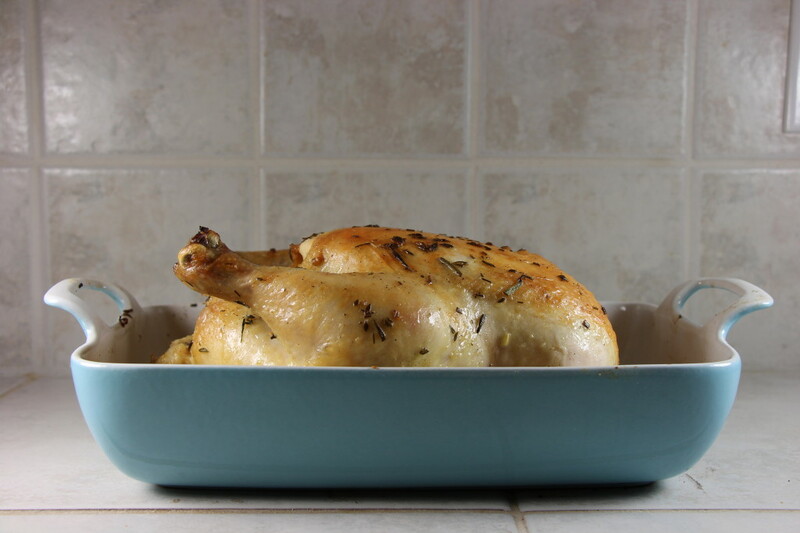 One of the simplest and best recipes for roast chicken I've found. Preheat oven to 375°. Rinse the chicken inside and out with cold water. Finely chop garlic. Blend in the remaining ingredients. Rub the herb paste all over the outside of the chicken. Set the chicken in a roasting pan (using a rack if you have one), breast side up, for 20 minutes. Turn the bird over, and roast breast side down for 20 minutes. Turn it over again and roast breast side up for 35 minutes longer, or until done according to a met thermometer. Let the meat rest, tented, for 15-20 minutes before carving. Collect the pan juices, skim off the fat, and use to moisten the chicken. Waters' original recipe calls for 1 tsp each fresh rosemary, thyme, and oregano (or marjoram), but you can play with the herb combinations. I used 1.5 tsp each fresh rosemary and thyme, because that's what I had. Fresh herbs are best, of course, but you can use dried, just reduce the quantities to a third (or a half) if you do. Waters also suggests that you process the garlic by rubbing it against the tines of a fork until it becomes a juicy puree. This has never worked for me so I just chop it very fine.